They are the ones who shell out their money and, more importantly, devote their precious reading hours to consuming your writing. And if they like your offering and give it a review, they have connected with and appreciated the random thoughts and wierdnesses that inhabit your mind. Can there be any better reward than that? 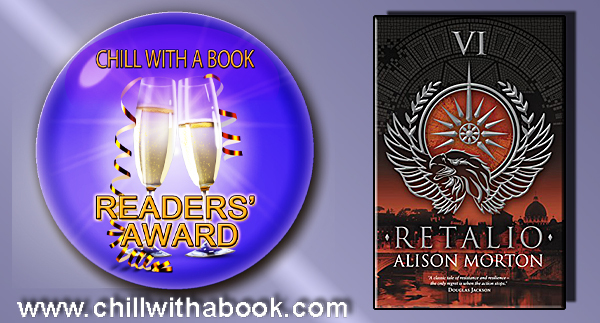 I was therefore delighted to learn that RETALIO had won a ‘Chill with a Book’ Readers’ Award set up by the indefatigable Pauline Barclay. Dance around the room and open the bubbly! A unique and thoroughly thought out alternative Roman history concept, which combined with a good plot makes this book an absorbing read. A taut action drama ranging over politics, military and espionage, set in a plausible Roman society that has survived to the late 20th Century. This book is fast paced, the military details are realistic and engaging. All of the characters are well developed. The ending had been building for years for the protagonist only to have an almost anticlimactic resolution. It was true to the lead character, but it left me wanting just a bit more violence towards her abuser? But I cannot fault the writing – excellent and gripping.